ASSIST currently provides a therapeutic service for family members traumatised as the result of the homicide of a loved one. This service is run in partnership with the National Homicide Service, currently managed by Victim Support. 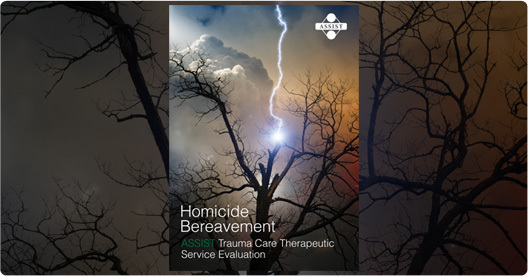 The Homicide Therapeutic Service is available across England and Wales. Both adults and children are eligible for this service, which is fully funded by the Ministry of Justice. Therapy sessions often take place in the bereaved person’s own home, although if this is not a suitable option an office location can be made available. It is also possible to visit bereaved children at school, which enables advice to be provided to school staff also. Death by homicide is clearly one of the worst type of bereavements possible for an individual, and often results in severe trauma symptoms as well as in acute bereavement. On top of all the horror and grief involved, survivors also have to cope with police enquiries, legal processes, court cases and intense media interest. In addition to a wide range of traumatic-stress symptoms, survivors are also faced with the knowledge that another person was responsible for the death of their loved one, with all the intense emotions this engenders. Over the last four years many people have found meeting with a specialist trauma therapist extremely helpful to them following the shock of a close family homicide. For a summary of the first four years of the ASSIST Homicide Bereavement Therapeutic Service please download our report. Referral to the ASSIST specialist trauma service following homicide is via Victim Support if the homicide was after April 2010. If the murder took place prior to April 2010 referral can be made by a range of other homicide support groups, including MAMAA and SAMM. It is never too late to seek help. In the aftermath of a major incident or national or international disaster, referral to ASSIST is via Disaster Action.